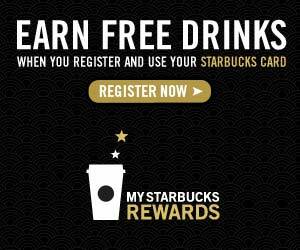 Did you know that you can earn Rewards from Starbucks. Register those Starbucks Gift Cards you got for Christmas and start earning. When you register your card with My Starbucks Rewards, you’ll earn 1 Star every time you pay with your Card. And as you collect Stars, you move up to bigger benefits. All registered Starbucks Card holders get a handcrafted birthday beverage of their choice. You can get started on the path to the Gold level and free beverages today. Just register a Starbucks Card.